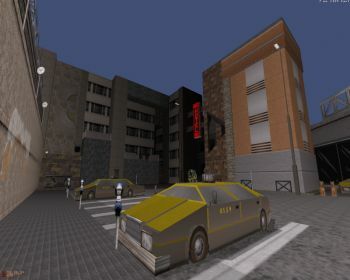 Description: Some might remember the "Dogville" incident from 2004: Taivo Maripuu's city map was taken down as a result of plagiarism allegations by Pascal Rouaud, the author of the Roch series which is thought to have come to a close because of the incident. Despite this (or maybe because of it), the map has been popular. I liked the map back then so I'm happy to be the first to release an extended and improved version of Taivo's infamous map. This 2012 version is more than double the size of the original map. Into It: The first part of the map is recycled from the old version but with some significant changes in design. This segment has the most polished and cleanest look, bearing strong resemblance to Taivo's more recent City Full of Alien Scum. You get to visit a bunch of locations in any order you choose, always picking up a yellow key and hitting a dog-shaped switch. Despite the visual changes, you're still essentially replaying the old Dogville. But that's just the beginning. You're then taken to brand-new locations that fit the overall look established at the beginning of the map. These new locations have a great sense of scale with interesting, unreachable things in the distance. Sure, you're still guaranteed a nice selection of more cramped indoor locations but what leaves an impression are the open areas. With more resources at his disposal, Taivo has crafted tons of juicy details, including detailed vehicles and impressive building exteriors. Due to its extended size, the map should now take you around an hour to complete: my first run took nearly 50 minutes, and even that left every secret (five in total) behind. I was lost once due to a rather unexpected use of the new room-over-room effect, especially as I was playing in the 32-bit mode (rather than in the recommended 8-bit mode), which causes visual glitches. Item-monster ratio is pretty good on average and respawns are mostly Battlelords and weak troopers, which helps reduce repetition a bit when revisiting locations. Conclusion: This extended version of an old map closes a sorry chapter in Duke3D's mapping history. It takes what was already a good map and makes it bigger and better. Every location shines in terms of spritework, texture usage and overall architecture, but it's the new areas that shine the brightest. Dogville's gameplay may not be revolutionary but its balanced item-monster ratio makes it a joyous ride. 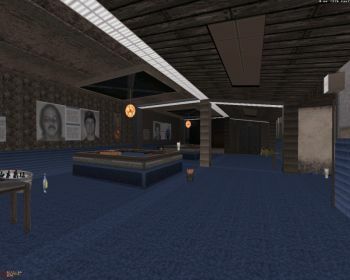 Dogville 2012 is a classic-to-be extension of a classic yet infamous map.